Step 1 Heat the oven to 425 degrees and line 2 large baking sheets with parchment paper. Step 2 In a stand mixer using the paddle attachment, or in a large bowl using an electric mixer, flat beater, or with a hand-held electric whisk, combine the tapioca flour and salt. Step 3In a saucepan, heat the milk and oil, bringing gently to a boil. Once it's bubbling, take the pan off the heat before it comes to a full rolling boil and immediately pour it into the flour mixture and turn on the mixer, beating slowly at first, until it forms a sticky batter. Step 4Continue beating the batter for at least 5 minutes (you want it to cool down before you add the eggs), then scrape down and check with your fingers to see if it is still hot to the touch. You need to cool it to about body temperature, which could take up to 10 minutes of beating. Step 5Once you have reached this point, gradually whisk in the beaten eggs, spooning them in very gradually, about a tablespoon or so at a time, and make sure that the egg is fully amalgamated before you add the next spoonful. Step 6Finally add — still beating — the Parmesan cheese in 2 batches, and continue to beat until all ingredients are, again, well combined. Step 7Scoop teaspoon-sized balls onto the lined baking sheets. If needed, dip the spoon in water every couple of scoops as the dough drops out of the spoon more easily. Leave a little space between the balls as they will expand as they bake; this makes about 4 dozen balls. Step 8Put in the oven, then immediately turn the heat down to 375 degrees and bake until puffed and with a golden tinge, 12 to 15 minutes. Let the cheese breads cool a little before serving. In Recipes-list.com we have selected the most viewed recipes from category - Breads Sides . Enjoy the best recipes specially selected for you! 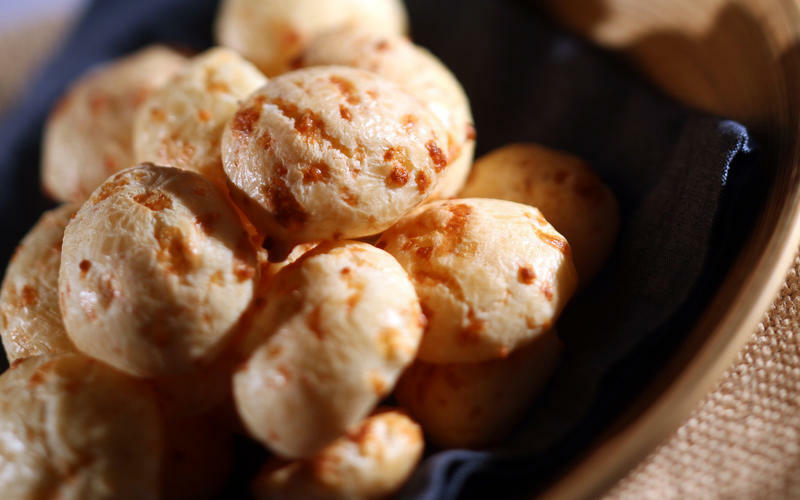 Brazilian cheese bread is the right choice that will satisfy all your claims.